Dollingstown's Marty Hughes shoots for goal. Dollingstown welcomed Lurgan Celtic to a sun drenched Planters Park on a superb playing surface in the quarter final of the Bob Radcliffe Cup with the home side featuring many new signings from the Hoops. After a keenly fought cup tie the Dollybirds squeezed through on penalties. There was very little activity in a tight first half in the final third of the pitch with both teams giving there all in a competitive midfield area. Celtic had a goal disallowed following a corner for pushing when there was nothing more than the usual scuffling by both sides as the corner was delivered and Dolling town hit the bar with a long range effort but that was the only action in a lack lustre drab game which looked more like a pre-season friendly to the spectators. Richard Thompson did force a good save from the Celtic keeper on 12 minutes following a great pass from Darrell Magee and a few minutes later Dale Malone fired wide for Celtic. The best move of the first half saw Jordan Gibson back heel the ball to Ritchie Thompson who fired an unstoppable effort from 30 yards that crashed off the bar to leave the score blank at half time . Dollingstown’s Magee was replaced at half time due to injury with Adam Walker coming off the bench . Once again little activity in the final third of a competitive game that never really got flowing due to some strange referring decisions against both teams. Manager Gary Duke then made a double substitution on 75 minutes with Glen Hand and Marty Hughes replacing Gibson and Rodgers. This looked an inspired decision as on 82 minutes Hand rounded the Celtic keeper but his touch took him wide and his shot on goal agonisingly drifted wide of the far post with what was the only real clear chance for either team up to this stage of the match. Celtic had their keeper sent off on 98 minutes for dissent and this was followed on 102 minutes when winger Chris Lavery was shown a second yellow card for diving in the area and Celtic were down to nine men with Dale Malone taking over as goalkeeper. The match was decided on penalties with Dollingstown scoring all five through Neil Lavery, Glen Hand, Marty Hughes, Aaron Moffett and Adam Walker with the unfortunate Colm Rooney missing the crucial second penalty for Celtic. After the pre-match build up of two local sides contesting a derby cup game the game was very low key and flat and Celtic played nowhere near their capabilities. Dollingstown thank match sponsor Wildwood Log Cabins. A much weakened Lurgan Celtic Youth side were beaten 2-0 by Ballinamallard Youth on Saturday. 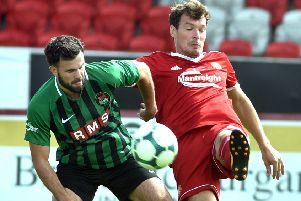 Celtic were without no less than eight players due to a local GAA final and efforts to reschedule the game proved fruitless.